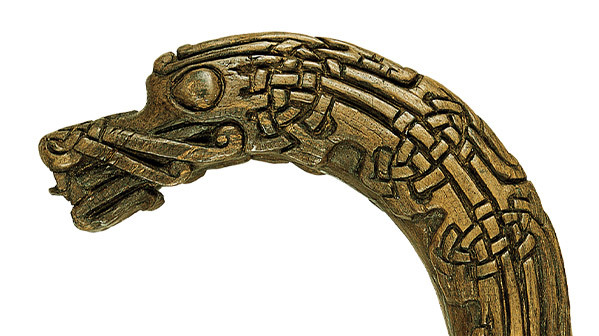 For a long time the Viking intervention in Ireland was an unsettled affair. The invaders suffered some serious military reverses. Groups of raiders moved back and forth between Ireland, Britain and the continent. The development of Dublin was shaped by these patterns. In 902 the Viking leaders were expelled from the town and withdrew to northwestern Britain. In 914, however, a large Norse fleet appeared off Waterford, having sailed from Brittany, and began making raids. Three years later this fleet was followed by Sitric Cáech, a grandson of King Ivár, whose dynasty had ruled in Dublin before 902. Sitric re-established control over Dublin while his brother Ragnall took control of Viking York. After Ragnall’s death, Sitric ruled the joint kingdom, combining Dublin and York. own culture, one that can reasonably be called Hiberno-Norse. Dublin was a mixed space, in terms of both culture and population. Some items of personal ornamentation, such as oval brooches typical of Scandinavian women, have been found in Ireland, but Dr Pat Wallace, former director of the National Museum, who led the excavations of the Viking Dublin settlements, points out that in none of the Dublin excavations have typically Scandinavian items of female personal ornamentation ever turned up. His conclusion is that the female population of the town was almost entirely Irish. ‘From a female point of view, it is a very Irish place’, he says. This makes it probable that Irish was spoken, alongside Norse, in Dublin, resulting in a pidgin ‘a bit like Hong Kong English’. Norse words (especially commercial and maritime terms) seeped into the indigenous language. This mixing meant that the town quickly acquired its own culture, which is well represented in this beautifully carved wooden crook, found during the Museum’s excavations at Fishamble Street. It is recognisably influenced by the Ringerike style, named after the district of Norway where it flourished. Ringerike, says Wallace, ‘was not particularly popular in England, but it caught on here, and the Irish Vikings turned it into their own expression, particularly in Dublin’. The purpose of the carved crook is unclear. It may have been a whip handle or a furniture finial. There seems to have been a concentration of wood-turners and coopers in Fishamble Street. It was there that what James Lang called the ‘Dublin school’ of woodcraft had its centre.